At the beginning of the century, keyword research was quite a simple thing – webmasters could collect a wide range of all the words somehow connected with your content, and it would rank high. Search engines’ algorithms were mechanical and robotic, so, looking for the pages relevant to queries, they relied on the number of similar keywords. Modern technologies of machine learning allow search engines to provide users with high-quality and relevant results based on their intent, not just on the words they use. That’s why building your SEO strategy around high-volume keywords doesn’t work anymore. Today there are loads of factors which matter for your website ranking and for traffic it drives. And user intent is one that matters significantly. In this post, I’ll tell you what user intent is, and how it should affect your keyword research. Understanding it, you’ll develop your SEO and improve your content strategy. Well, what actually is user intent? It’s the reason why a person types his or her query into the search field. If I enter ‘how to fix a zipper’, Google will understand I need instruction, not a link to an online shop with garment accessories. That’s why to implement an intent-based SEO strategy, first of all, you should know what types of intent experts usually distinguish. You can see Google selected all the possible results people could expect conducting such a query. When users don’t denote their intent, the search engine will provide them with several types of search results. Knowing what your potential customers want to find on your website is the key to success. You should identify who your target audience is if you want to drive conversion. For instance, I run a travel blog and create a post called ‘Around the world in 80 days,’ which is the name of both a popular film and a book. Although the volume of this key phrase is pretty high, if I manage to rank for the query, the huge traffic driving to my website won’t bring me that many subscribers. Why? Because, in 99% of cases, their intent will be to watch the film or read the book. Furthermore, not only organic SEO but also your PPC campaign can suffer from targeting the wrong intent. Do you remember PPC stands for ‘pay-per-click’? Not denoting clear intent can provide false expectations for users. If they click through your advertisements and then leave the page not seeing what they expected, you’ll spend loads of money in vain. So, targeting the keywords which don’t fit your intent won’t improve your conversions and can even result in wasting money. That’s why conducting keyword research and creating content for your website, you should consider user intent. 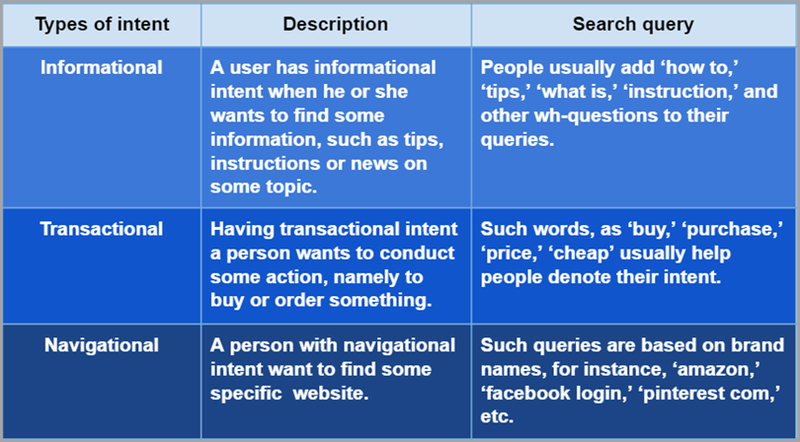 What does user-intent keyword research consist of? Everyone who knows the basic SEO concepts will tell you about search volume, competitive analysis, and maybe even about the keyword difficulty level. But most of them will probably forget about such a crucial factor as user intent. Unfortunately, it’s not that easy to select only intent-based keywords (and there’s no need). I’ve circled out best practices which will help you target the right intent for your website. Google algorithms not only see target keywords, but they also consider the whole content of the page. And LSI (Latent Semantic Indexing) keywords are those which will help you answer users’ queries and create useful content. These words provide high relevancy and let search robots better understand the content, meaning and synonymic context of the search query. For instance, if your text contains such words as ‘engine,’ ‘tires,’ ‘install new filter,’ etc., search engines will determine that you write about auto repairing and your site may rank for a ‘auto repair’ search question. What if your new post’s main keyword is ‘friends’? 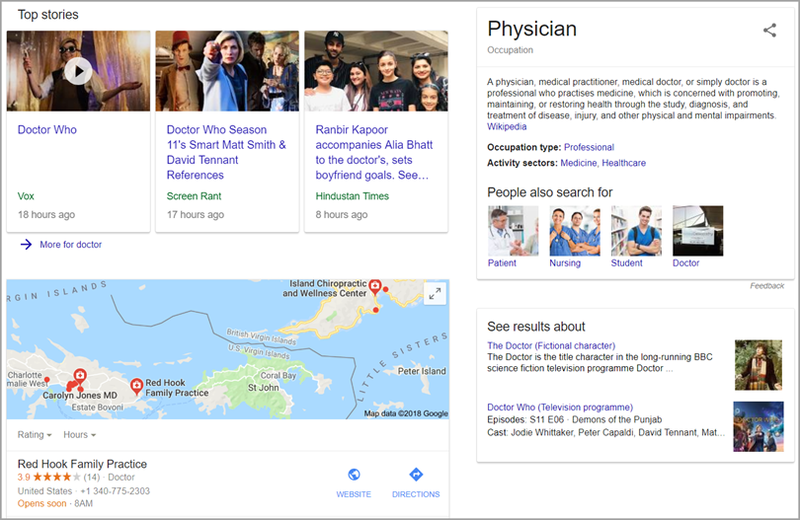 How does Google understand whether you write about people you’ve got the platonic relationship with or your article is about the popular TV series? In this case, search robots indexing your page and seeing the phrases ‘episodes,’ ‘Lisa Kudrow,’ ‘David Crane’ will understand that the topic is about the TV series. The words ‘friendship,’ ‘relationship,’ ‘faithful’ will denote that, perhaps, the post contains tips on how to be a good friend. The easiest way to collect such words is by typing your keyword into the Google search field and looking at the search suggestions the search engine provides. Choose phrases consisting of more than two words. Selecting long-tail keywords is also useful if you want to hit the top as soon as possible. Although they may have low or mid-volume, these phrases usually drive higher conversions, as people using long phrases often know what they’re looking for. If you’re not sure whether you can select intent-based keywords, look at the most successful market players in the niche. What keywords do they rank for? To find out the answer, the first thing you should do is to identify your closest rivals. If you’re opening a hair salon, and you’re not sure who your main competitors are, you can simply enter ‘hair salon [your city]’ in the search field. The top results provide you with the most popular hair salons in your city. Add your intent-based keywords to the metadata displayed in your snippets. Use your LSI words not only in the body of your article but also implement them into your metadata texts. It’s essential to make your page intent clear in your snippet, as this brief extract affects your click-through-rate and rankings significantly. Why is it that important? Yes, metadata isn’t actually a ranking factor. But the impression it provides can cause great or bad user experience. If I type ‘iPhone’ into a search engine and I am willing to buy a new one and not denoting my intent in the search query, Google will provide me with the results with both informational and transactional intent. In this case, the snippets with ‘buy’ keywords will be the signals for me that there are online shops where I can purchase what I want. If some shop doesn’t denote its intent in the metadata and provides only such data as phone characteristics, I’ll think there’s some review on iPhone features and won’t click through the link. In this case, even high ranking won’t drive significant traffic. Last but not least. The conclusion you could have walked away is probably that you should separate informational and transactional intent and never mix them. But it’s not that simple. Having an eCommerce website, you shouldn’t dwell on transactional intent alone. Even though people looking for ‘how to’ queries obviously have informational intent, they may well become your customers. For example, most SEO companies not only promote their service but also run blogs where they answer to most typical SEO questions and give tips. So, if you search for ‘keyword research’ half (or even more) of the posts in the search results will be written by SEO companies which strive to increase brand credibility and gain new customers. The best tactics for an eCommerce website is to provide both informational and transactional intent. Once a user finds out the necessary data on your site, his or her next step may be becoming your client.